Hey there! It’s Sunday which means it’s Slimming World Sunday. Stephanie from Raising Emily and myself “resurrected” the idea and we’d love it if you could leave your link below. This week was a heap better. Chris has been a whole heap more positive about a bunch of things and it’s meant that we had a meal plan at the beginning of the week. I did the food shopping on Sunday (which stressed me out a bit to the point that I gave in when chocolate was calling my name!). On Monday Chris started his new job which meant that he had the car all week so minus Friday when my dad played taxi for me, I’ve walked or taken the bus everywhere this week. I hoped that was going to show when I stood on the scales but it didn’t the scales showed that I had put on an extra pound not lost any. I figure this could because of developing those walking muscles or that my body is having a little panic and trying to store fat rather than burn it given that I’ve ended up doing so much exercise this week. Hopefully it’ll show up this coming Thursday and makes a difference. I do feel better in myself and actually getting out in the open air has made me feel better. Tuesday was a bit hard because of the weather change while I was out – Jaxon had his waterproof cover on but I didn’t have a coat and ended up walking home in the rain lol. I did even attempt running with the buggy on a couple of occasions but it doesn’t seem to be weighed enough at the front so it sort of bobs up and down – I think I need to pack the changing bag into the basket on the bottom so that it weighs it down a bit more. I guess if I had the money in my pocket I’d spend out on a running buggy or the nano one that folds up into a backpack sort of shape, oh well I can dream haha! This week has more walking and some could be at a fairly decent pace if I end up meeting Mrs B on Monday again! Will do my best to avoid the cake and will try and take snacks for Jaxon with me so that I’m not tempted to go up to the coffee shop counter more than once lol. Today’s job is to write the food plan and try to make sure they are Slimming World friendly or at least low syn. I’m fed up of this faffing about around the two and a half stone mark, three stone isn’t that far away but these last 7lbs are seriously alluding me. Could someone beat me with a stick when I try to eat chocolate or cake please? 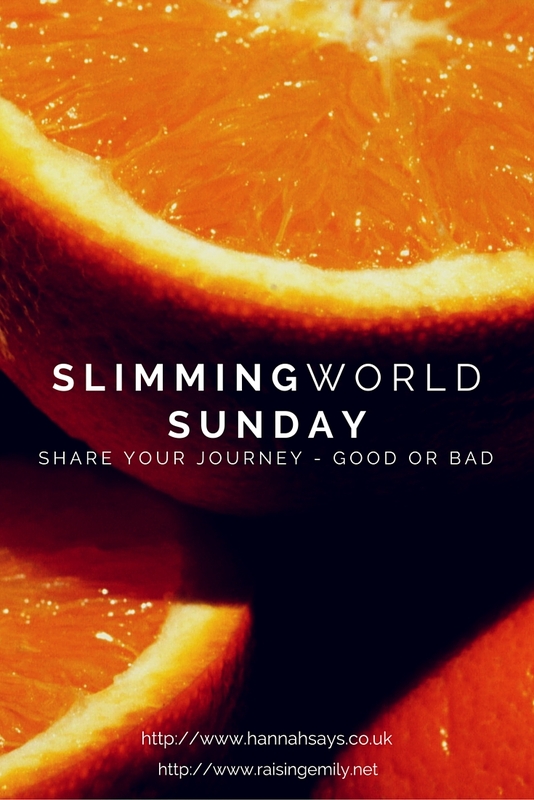 This entry was posted in Challenges, Goals and Achievements, Health and tagged getting healthy, slimming world, Sunday. It is so disheartening when you’ve had a good week but see a gain, though as a result you will hopefully have an amazing weigh in this week as a result! Good to hear you’re feeling better in yourself at least! I think I was placing too much on all the exercise that I’d done. I’d done all the exercise but I didn’t always eat so well, so that was probably the problem – I guess we’ll see though. This week’s weigh in is two days away, I’m off for a coffee date tomorrow with my friend who currently lives in NY so I’ll probably end up having cake but I am walking there and back so that balances right? I’ll try to make sure I have a small bit of cake rather than a large bit! Thanks lovely! I think I just have to start walking crazy distances like our friend Lucy – she seems to walk all over the place! I walked with her last week to the Pavilion for the knitting group and was shattered when I got home!